Izumo Taishakyo Mission of Hawaii's 29th Golf Tournament will be held at Ewa Beach Golf Club on Friday, May 24, 2019. Download the flyer below for more information and to complete an entry form. Forms are due by May 10, 2019. On October 7, 2018 for the first time, Izumo Taisha awarded 2 - $2,000 scholarships at the 112nd Autumn Thanksgiving Festival. These awards were made possible through the contributions and donations from the 28th Scholarship Golf Tournament held earlier in the year. The two recipients are: Migiwa Kawachi and Katelyn Nakasone. Migiwa is a PhD candidate at the University of Hawaii studying in the field of Botany. She expects to graduate in May, 2019. Migiwa is a long time member of Izumo Taisha. Katelyn is a student at the University of Nevada at Las Vegas and is expected to graduate with a degree in nuclear medicine in 2020. Katelyn’s mother Leanne Nakasone accepted on Katelyn’s behalf. Katelyn’s proud grandmother, Kay Takemori, is a long time member of Izumo Taisha. Izumo Taisha will be awarding four (4) - $1,000 scholarships to high school graduates from Hawaii. The scholarship applications are due on April 24, 2019. Reference letters are due on May 3, 2019. 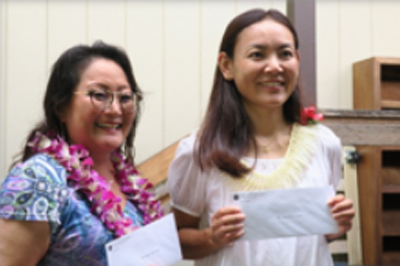 The scholarships will be awarded during the Annual Scholarship Golf Tournament to be held on Friday., May 24, 2019 at Ewa Beach Golf Club. Alternate Energy, our energy contractor, will be adding a total of 54 photo voltaic panels on the roof of the Yamane Hall and the priest’s cottage. The process for obtaining a building permit took over a year but we’ve finally secured a permit. The new panels will reduce our monthly electric bill by over 50%! The work will commence in December, 2018 and will take approximately 2 days to install. Izumo Taisha has added two ramps to allow for better access to the rest rooms and from the main temple gate to the parking lot. The ramp was constructed in one day by Quality General Inc. Previously, a heavy wooden ramp was stored between the Yamane Hall and the rest rooms. The ramp will be disassembled allowing more access to the rest room area. Download the newsletter for Spring 2019.